Improving nitrogen efficiency in wheat. Following on from cereal trials in previous years, Ecoculture wanted to confirm that nitrogen from NHDelta was significantly more efficient than standard forms of nitrogen. Previous results had shown that the addition of low volumes of NHDelta could increase yield quite significantly but more intriguingly there was the potential to reduce total nitrogen inputs without sacrificing yield. 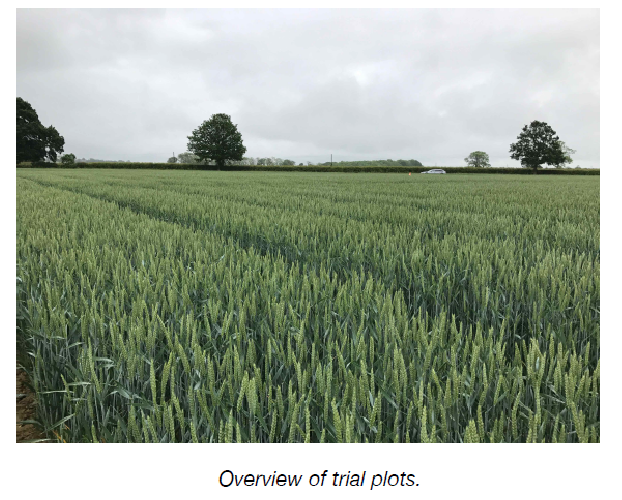 In 2016 a fully replicated field trial in Santiago winter wheat, showed that it was possible to reduce the standard rate of nitrogen from 207 kg N/ha to 145 kg N/ha (a 30% reduction in total N) and increase yield from 9.1 t/ha to 9.3 t/ha – if a programme of 4 sprays of NHDelta Ca + 1-4-All (5.0 l/ha + 2.0 l/ha) was followed. By comparison if nitrogen was used alone at the reduced rate the yield collapsed to 8.8 t/ha. This gives a rough calculation that NHDelta Ca is at least seventeen times more efficient than standard forms of N.
To confirm these results a trial was conducted by the highly respected research company NDSM. A crop of winter wheat (var. Revelation) was drilled on the 17th September 2016 at a seed rate of 164kg/ha. The trial was fully replicated and results subjected to statistical analysis. The trial was set up to compare use of NHDelta Ca with the farmer standard practice of using 250kg nitrogen / hectare (ammonium nitrate, split over 3 applications). To look at enhancing crop yield, standard practice was compared to the farmer standard plus four sprays of NHDelta Ca + XStress (5 litres/ha + 1 litre / ha) applied four times. Applications were made at 2 true leaves, beginning of tillering, at first node and flag leaf. The total amount of nitrogen applied was slightly higher at 253.8 kg nitrogen / hectare. Finally, to compare with both the other treatments and to see if nitrogen could be reduced, the farmer standard nitrogen was reduced by 20% plus four applications of NHDeltaCa + XStress (as per above) were made, a total of 203.8 kg nitrogen / hectare. Addition of the extra sprays of NHDeltaCa increased the yield in both cases compared to farmer standard. Where the base nitrogen remained unchanged at 250 kg, the yield increased by a significant 0.6 t/ha an increase of 6%. Where the base nitrogen was reduced by 20% to 200 kg, the total yield increased by 0.2 t / ha, an increase of 2% but more importantly the nitrate loading was substantially reduced. The flip side of increasing yield whilst reducing nitrogen inputs is to look at the nitrogen efficiency of the inputs, expressed as kg nitrogen per tonne grain. The lower the figure the greater the efficiency. Comparing the farmer standard to the reduced nitrogen programme plus NHDeltaCa the kg N /tonne grain reduced from 24.8 to 19.8, a 20% improvement, or put another way at least thirteen times more efficient than standard nitrogen. The results from the 2017 trial confirms the 2014 results. NHDelta nitrogen is on average at least 15 times more efficient than standard nitrogen when used in an integrated programme. By using a programme of 4 sprays of NHDelta Ca plus either XStress or 1-4-All there is a potential to increase yield significantly by maintaining overall nitrate levels or to maintain yields with a reduction of nitrogen by 20 – 30%. This offers growers the potential management tool of maximising yield of the crop or reducing inputs to gain environmental benefits. In either case, through greater yields or lower inputs, the nitrogen efficiency in terms of kg N /tonne grain improves compared to farm standard, maximising the output to input value. In other words, growing more from less.